In the last decade, pathologic approaches concerning diagnosis and treatment of lung carcinomas have increasingly moved towards the implementation of molecular methods into the process of decision. In this study, an overview is given referring to the variety of tumors in the lung including common primary lung neoplasms and secondary tumors, and a modus operandi is presented which integrates immunology as well as molecular pathology within the process of finding correct diagnoses. Besides the conventional and approved methods and techniques leading to appropriate treatment including so-called targeted therapies, pathologist's work meanwhile depends on both histologic and molecular results. Since molecular techniques have increasingly entered the field of routine diagnostics, challenges and possibilities have changed and are still rapidly developing. The proceeding integration of molecular-biologic investigations into the process of diagnosing has changed the nature of diagnostics and will continuously grow in the near future. Only by obtaining a proper diagnosis, the optimal treatment of a patient can be assured, whereupon the knowledge of gene mutations and/or altered protein expression is crucial. By identifying those novel molecular target structures, the therapeutic spectrum is tremendously enlarged and will finally improve the patient's prognosis by personalized targeted therapies. 2. Nuclear shape in papillary thyroid carcinoma: a role for lamin B receptor? Irregularity in the nuclear shape, with extensive folds and invaginations of the nuclear membrane (NM), remain the basic diagnostic feature of papillary thyroid carcinoma (PTC). The biological reasons for these irregularities are obscure, but evidence has been presented that they might be linked to RET/PTC gene translocation. In the present study, we have investigated the hypothesis that the NM irregularities in PTC might be linked to alterations in the expression of lamin B receptor (LBR), a component of the inner NM responsible for the distribution of Lamin B and associated chromatin. Fisher AH et al. already reported on the lack of LBR in PTC, a finding in contrast with the observation that a reduced expression of LBR because of gene mutation is responsible for the lack of nuclear segmentation of granulocytes in Pelger-Huet anomaly. In the present study, we confirmed the lack of immunohistochemical staining for LBR in PTC nuclei, in contrast to a positive staining in intestinal epithelium and stromal cells. However, Western blot and RT-PCR analysis demonstrated a strongly positive reaction in PTC extracts, thus proving an expression of LBR higher in PTC cases and cells than in follicular carcinoma cells. In conclusion, our data suggest that LBR is heavily expressed in PTC cells, but an abnormal folding of the protein might explain its lack of immunohistochemical reactivity and be associated with the anomalous folding of the NM. In this study, we included 26 cases diagnosed as squamous intraepithelial lesions, which were examined histopathologically, and in terms of p16, E-cadherin and Ki67 immunoexpression. In low-grade lesions, p16 expression was limited to one third below the epithelium, E-cadherin has a membranous pattern and Ki67 proliferation index had low values. In high-grade lesions, the p16 diffuse stain was present in two thirds or all epithelium layers, E-cadherin expression became aberrant, with membranous and cytoplasmic pattern and Ki67 proliferation index was high. These biomarkers have proven useful to accurately assess the extent of lesions and to identify lesions with high risk of progression. The prognostic value of tumor-associated angiogenesis is still a subject of debate. As microvascular density and the expression of different growth factors were not demonstrated to be good predictors of the response to antiangiogenic and antivascular therapy, there is a strong need to search for more sensitive markers. In the present study we evaluated by double immunohistochemical staining the profile of tumor-associated blood vessels and the rate of endothelial cell proliferation in patients with thymoma (n=38). Results were compared with specimens of normal thymus and from patients with myasthenia gravis. We found a significant increase in the number of immature and intermediate blood vessels in the tumor area of thymoma, regardless the histological type of the tumor. Proliferating endothelial cells were found in 15 cases, and co-expression of Ki67 and CD34 had the highest value in immature vessels. Both blood vessel type and endothelial cell proliferation significantly correlated with invasive thymoma. Based on these findings, it can be assumed that the type of tumor-associated vessel together with endothelial cell proliferation are useful predictors of invasion, immature and intermediate vessels can be targeted with antivascular drugs and endothelial cell proliferation could be used as a good predictor of the response to antiangiogenic therapy. The systemic lupus erythematosus (SLE), a systemic autoimmune disorder with a multifactorial etiology, is characterized by the presence of autoantigens in some organs and tissues that induce the development of some antibodies with extended binding and with various specificities. The presence of antibodies is accompanied by disbalances in the immune cellular response, including alterations in the production of some cytokines. Cytokines, quite a heterogeneous group of protein molecules produced in small quantities by certain specifically stimulated cells, have the capacity to maintain the communication between different cell populations that participate in the immune response (messengers of the immune system), thus modeling a defense function. Objectives: The purpose of the study is to estimate the seric levels of some proinflammatory, anti-inflammatory and immunomodulating cytokines in patients diagnosed with SLE, as well as some correlations between the seric levels of these cytokines and the histopathological aspects. Material and Methods: There were included in the study 35 patients diagnosed with SLE (active/remission stage of the disorder), in whom there were determined, before administering the treatment with the immunoenzymatic technique ELISA, the seric level of the following cytokines: interleukins (IL) IL-2, IL-6, IL-8, IL-10, and the tumor necrosis factor-alpha (TNF-alpha). The obtained results in the patients were compared to those observed in a control group, made up of 35 healthy subjects. Results: The IL-2 production of T-lymphocytes was a deficient one (low seric levels in the majority of the patients), while cytokines IL-6, IL-8 and TNF-alpha showed high seric levels. IL-10 plays a very important role in the SLE pathogeny, through the high seric levels, and it may be involved, as a predictive biological marker, in the quantification of the activity degree of the disorder. Conclusions: SLE represents an autoimmune disorder, characterized, among others, by a disbalance in the cytokine network. Signaling and regulating abnormalities of B-lymphocytes by cytokines are responsible of the excessive production of antibodies. IL-6 and IL-10 were proved to be key factors in the intensification of the inflammation and regulation of B-lymphocytes activity, by their polyclonal activation. Alongside TNF-alpha, they play an important part in the development of severe dermo-epidermal alterations. Objective: Although oral keratinocyte stem cells play a key role in tissue homeostasis, wound healing, and neoplasia, they remain difficult to identify and characterize. The specific aim of the present study is to characterize an oral keratinocyte stem-cell population separated using a magnetic technique. Material and Methods: Oral human keratinocytes obtained from keratinized oral mucosa were magnetically separated using a proliferation-related marker, CD71 and alpha6beta4 integrin. The expression of different stem cell markers: CD44H, Nestin, Nanog, Oct 3/4, CD117 was checked by immunofluorescence. The ability of alpha6beta4pos CD71neg fraction to form oral epithelial equivalents was also assayed. Results: Three different oral keratinocyte subpopulations were obtained following magnetic separation: alpha6beta4pos CD71neg, alpha6beta4pos CD71pos and alpha6beta4neg. Our alpha6beta4pos CD71neg stem cell fraction was positive for Oct 3/4, CD44H and cytokeratin 19 while Nanog, Nestin and CD117 expression was absent. At the same time, the other two cell fractions alpha6beta4pos CD71pos and alpha6beta4neg were negative for all stem cell markers. Also, alpha6beta4pos CD71neg fraction was able to regenerate a well stratified and organized oral epithelial equivalent. The distribution of cytokeratin 19 and involucrin in the oral epithelial equivalent reflected the in vivo situation in oral gingival epithelium. Conclusions: The human gingival alpha6beta4pos CD71neg fraction was strongly positive for a panel of stem cell markers and could form oral epithelial equivalent. It is also suggested that a magnetic system may be an important tool in acquiring oral keratinocyte stem cells for research. Despite considerable progress in the development of individualized targeted therapies of tumor diseases, identification of additional reliable target molecules is still mandatory. One of the most recent targets is microtubule-associated human EML4 generating a fusion-type oncogene with ALK demonstrating marked transforming activity in lung cancer. Since EML4 is a poorly characterized protein with regard to expression, function and regulation in human tissue, specimens of human tumor and tumor-free tissues obtained from patients with NSCLC were analyzed to determine the cellular localization. All tissue samples have been previously fixed with the novel HOPE-technique and paraffin embedded. Determination of both gene expression and protein levels of EML4 were performed using RT-PCR, in situ hybridization as well as immunohistochemistry, respectively. In human NSCLC tissue samples, possible regulation of EML4 transcription upon chemotherapy with combinations of most established cytotoxic drugs for NSCLC treatment was also studied employing the recently established ex vivo tissue culture model STST. In normal lung, both marked mRNA and protein levels of EML4 were localized in alveolar macrophages. In contrast, lung tumor tissues always showed consistent transcriptional expression in situ and by RT-PCR. Stimulation of NSCLC tissues with chemotherapeutics revealed heterogeneous effects on EML4 mRNA levels. Based on its expression patterns in both tumor-free lung and NSCLC tissues, human EML4 is likely to be closely associated with processes involved in local inflammation of the lung as well as with tumor behavior. Thus, our results suggest that EML4 may have the potential as a therapeutic target molecule in NSCLC chemotherapy. Background: The characteristics of the cellular kinetic reflect the aggressiveness of the tumors and even their prognosis, many studies proving the correlation between the increased proliferation activity and a poor prognosis in a variety of neoplasms. Aim: The analysis of immunohistochemical expression of the Ki-67 antigen using the monoclonal antibody MIB1 in 61 patients with gastric cancer, the correlation with clinicopathological factors and the prognosis of the patients. Material and Methods: We used the primary MIB1 antibody pre-diluted, using the LSAB technique, DAB visualization. The quantification of the reaction was performed by appreciating the marking index Ki-67 (MI Ki-67). Although all the lesions were positive, we noticed a marked intratumoral heterogeneity regarding the distribution of the Ki-67 score. The tumor cells were considered Ki-67 positive in the presence of brown nuclear staining of granular or diffuse type. The tumor invasion front has shown the most numerous Ki-67 positive cells. Results: In the gastric carcinomas, we remarked various Ki-67 scores. For a proper grouping of the results, we classified gastric carcinomas into two categories: carcinomas with high MI Ki-67 (>=45%) and carcinomas with low MI Ki-67 (<=45%). We noticed an increased frequency of high MI Ki-67 carcinomas in elderly patients (p=0.03) and also in the tumors developed at cardia level and those extended in the entire stomach in the moment of diagnosis (p<0.001). The histological forms associated to high Ki-67 values are represented by the anaplastic carcinoma (100% of cases) and papillary adenocarcinoma (60% of cases).We observed a close correlation between the degree of tumor differentiation and the Ki-67 score (p<0.001). The results of our study do not reveal any correlation between the Lauren's Classification of gastric carcinomas, the lymphovascular invasion, the depth of tumor invasion, the TNM stage and the Ki-67 score (p>0.05). Conclusions: In our study, immunohistochemical assessment of the tumor proliferation does not represent a prognostic factor, but seems to be useful in identifying of a group of patients with aggressive tumors, needing adjuvant postoperatory chemotherapy. Objective: To report the morphometric characteristics of ultrastructure inside A549 cells. Methods: A549 cells were processed for inverted microscopy and transmission electron microscopy (TEM). Cell images were obtained randomly using inverted microscopy and TEM. The morphometric parameters of ultrastructure were tested using precise morphometric techniques by Image-Pro Plus analysis software. Results: (1) The diameter of A549 cells from inverted microscopy and TEM images was 14.93 micrometers and 10.59 micrometers. (2) By defining cell as reference space the volume densities (VV) of nucleus and cytoplasm were about 0.28 and 0.72; the surface densities (SV) of nucleus were 0.19 micrometers(-1). By defining cell nucleus as reference space the VV of nucleoli, euchromatin and heterochromatin were 0.076, 0.72 and 0.20 respectively; the SV of nucleoli was 0.15 micrometers(-1). By defining cytoplasm as reference space the VV of mitochondria, lamellar bodies and lysosomes were 0.046, 0.025 and 0.014; the SV of mitochondria, lamellar bodies and lysosomes were 0.60 micrometers(-1), 0.36 micrometers(-1), and 0.18 micrometers(-1). (3) In individual A549 cell total volume and surface of mitochondria were 61.91 cubic micrometers and 1001.67 square micrometers; Total volume and surface area of lamellar bodies were 76.82 cubic micrometers and 428.68 square micrometers; Total volume and surface area of lysosomes were 21.69 cubic micrometers and 212.04 square micrometers. Conclusions: The morphometric parameters of some ultrastructures within A549 cells were established using precise morphometric techniques by Image-Pro Plus analysis software. ADAMs (a disintegrin and metalloproteinase) family have been associated with the process of proteolytic "shedding" of membrane-associated proteins ectodomain and hence the rapid modulation of key cell signaling pathways in tissues microenvironment. A variety of cytokines, chemokines and growth factors which are initially produced as transmembrane proforms are activated by these sheddase activities. ADAM12 is highly expressed in rapidly growing tissues such as placenta and malignant tumors and it was found as one of the Candidate Cancer Genes in a comprehensive mutational analysis of human breast cancers. Our aim was to determine the gene expression profile of ADAM12 in breast cancers in comparison with normal breast and to correlate their level of expression with the clinical and pathological characteristics of breast cancers. Gene expression of ADAM12 spliced variants (12L and 12S) was evaluated using quantitative reverse-transcription PCR in samples obtained by laser capture microdissection from 38 patients with breast cancers and compared with adjacent healthy breast tissues. Both ADAM12L and 12S expression were significantly up-regulated in breast cancers, while in the normal breast, we found a very low expression. ADAM12L expression was significantly correlated with the histopathological types and, although not statistically significant, ADAM12 both variants were up-regulated in high-grade, highly-proliferative and HER2/neu positive tumors. From these preliminary results, we found that ADAM12 could be an interesting marker and eventually a therapeutic target for breast cancer. Introduction: Angiogenesis plays an important role in the uncontrolled proliferation, invasion and metastasis of cancers. Increased microvessel density (MVD) is known to be associated with evolution and aggressiveness of the endometrial carcinoma (EC). The formation of new vessels depends on interactions between various hormones and growth factors. VEGF is one of the most known promoters of angiogenesis. Material and Methods: In this study, we intend to evaluate the relation between MVD, the VEGF expression, and the clinicopathologic factors in patients with endometrial carcinoma. Formalin-fixed, paraffin-embedded tissue from 54 patients with EC were included. MVD was assessed with anti-CD34 in most intense areas of neovascularization. A semiquantitative scoring system was used to asses the intensity and degree of staining of VEGF. Results: MVD counts of patients with G1 EC was lower than patients with G2 and G3 EC. MVD counts of patients with stage I EC was lower as compared with stage II + III patients. There was no statistically significant difference between MVD counts in lymph node-negative and positive EC patients. The positive immunoreactions for VEGF were significantly more frequent in G1 EC in comparison to the patients with G2 + G3 EC. Conclusions: MVD and VEGF are important indicators of a poor prognosis in patients with endometrial carcinoma. Background: Detection of amyloid can be done by several techniques either histochemical or immunohistochemical. Among them, one of the less mentioned in texts of reference and in reports on amyloidosis, is the examination with ultraviolet light of the stain of Congo red. We intend to examine cases of amyloidosis stained with Congo red with ultraviolet light and to see if such method offers advantages with respect to Congo red only and to immunohistochemistry. Material and Methods: We examined 12 cases of cutaneous amyloidosis Hematoxylin-Eosin, Congo red stains (with and without permanganate treatment), Thioflavin T and immunohistochemical stains. We also evaluated Congo red fluorescence (CRF). Results: 66.66% were women and 33.34% were men. The traditional methods for the detection of amyloid (Congo red and Thioflavin T) were positive in 87.50% while immunohistochemistry was positive in 100% of the cases. In one case, immunohistochemistry detected Congo red negative deposits of amyloid. In another case, immunohistochemistry was strong while CRF was weak. CRF was always weak in all the cases in which it was seen. Conclusions: Immunohistochemistry is superior in the detection of cutaneous amyloid over the other techniques tested. CRF did not result, in our experience, to be so useful. Background: The t(14;18) translocation, which leads to an overproduction of the bcl-2 protein, supposedly occurs in almost all follicular lymphomas (FL) and can be detected by FISH methods or by PCR. Its detection is useful in monitoring the response to therapy and in assessing minimal residual disease in bone marrow. Recently it was observed that the translocation could become negative after treatment. The prognostic and predictive significance of this fluctuation is not entirely understood. Aim: We intended to find significant correlations among morphological features, histological grades, immunohistochemical findings, and cytogenetical aberrations in malignant follicular lymphomas, in order to identify the prognostic and predictive value of the bcl-2/IgH translocation in these malignancies. Material and Methods: We conducted a study on 79 patients with follicular lymphomas. The study was carried out on tissue samples selected from the "Victor Babes" National Institute of Pathology files. These samples were tested by immunohistochemistry and FISH. Results: Most of the cases (65.2%) were low-grade FL (grade 1-2). Approximately 58.8% of cases in the FISH study group presented t(14;18). In 66.6% of the cases with t(14;18), the immunohistochemical reaction for bcl-2 protein was positive. A significant positive correlation was found between the IHC positivity for bcl-2 and t(14;18) detected by FISH (p=0.04). Conclusions: Bcl-2 t(14;18) plays an important role in the pathogenesis of follicular lymphoma. FISH is an important tool in the diagnosis, treatment and follow up of these malignancies, since the immunohistochemical testing is negative in a significant proportion of cases. The article presents statistical correlations of immune cell parameters investigated in patients diagnosed with skin melanoma stage I. Recent data indicate a suppressed immune response, probably sustained by immune-regulating molecules expressed or shed from the tumor. These molecules block an efficient immune response and thus the tumor develops. All the molecules that are part of the tumor escape mechanisms can be targets for immune-mediated anti-tumor agents. We try to find the significance of some immunohistochemical markers (UCHL1, CD4, CD8) in tumoral inflammatory infiltrate and to establish the statistical correlations between molecular markers and tumor grade and stage. The studied parameters were: CD3+, CD4+, CD8+, CD56+16+ and CD19+. The statistical results were performed with SPSS v. 15.0. We demonstrate that a CD4+ on-going immune response is elicited in the investigated patients. We found a possible compensatory mechanism between T-lymphocytes and NK-cells and also between the antibodies generating cells and the natural cytotoxic cells. We are confident that these statistical correlations between clinical, immunological and immunohistochemical data can be useful in the disease management and personalized immune-therapy. This paper presents the consequences of long exposure to ozone in order to draw attention to this matter as far as the brain and liver are concerned. The material used was represented by two batches of 10 rats each that were daily exposed to ozone for 10 minutes at 0.5 ppm O3. From the first group blood was collected after two weeks to determine the indicators of oxidative stress and samples of brain and liver were drawn for histological studies. Tissue changes were highlighted using Hematoxylin-Eosin and argentic impregnation. In addition, the brain and liver samples taken from study subjects were turned into homogeneous preparations in order to determine the intensity of oxidative stress occurred in these organs compared with the witness group. The second batch was exposed for a further two weeks, after which the same sampling techniques and determining methods as for the first group were applied. The results show a correlation between the values of malondialdehyde (MDA) and glutathione (GSH), obtained both in blood and in the homogeneous preparations, and the microscopic changes that implicate a pathological state. Therefore, cerebral edema was discovered in the brain hemispheres and the cerebellum indicating necrotic signs accompanied by a reduction in the molecular layer and Purkinje cells with pale core. The liver presented hepatocellular necrosis, extended from the port area to the centrolobular vein. Introduction: Osteoporosis is a common affection characterized by a reduction of bone mass that affects mostly women after menopause. It currently leads to fractures, especially of the spine and hip thus enhancing the costs of medical care. There are many factors that contribute to its development, leading to various strategy lines to deal with it. Aim: The present study aims at showing how a multidisciplinary, multifactorial approach can be effective in treating and preventing new osteoporotic fractures. Material and Methods: The study included 17 patients that had replacement arthroplasty for femoral neck fractures. Bone tissue fragments were obtained from all of them and analyzed by pathology specialists. A dual-energy X-ray absorptiometry exam was also performed on each patient. In the end, the data was collected and processed by rehabilitation experts in order to establish proper therapy. Results: The hip fracture incidence was two times more frequent in women than in men, higher in the 71-80-year-old group. By analyzing the bone fragments atrophy could be seen, especially in the femoral neck as well as lamellae and osteon reduction and bone architecture alterations. Conclusions: Surgical or pharmacological treatments alone are not sufficient for handling osteoporosis. Strategies such as preventing falls, a proper diet, treating associated conditions and a well-established exercise program need to be considered. Specialists from several areas such as pathology, orthopedics, endocrinology, internal medicine and rehabilitation should work together to design the best approach to deal with osteoporosis. New radiographic maxillofacial techniques, cone beam computerized tomography (CBCT) are a necessity in the assessment of jaw bone offer to effectively evaluate the treatment. Aim: To quantitatively and qualitatively evaluate anterior mandibular area on CBCT comparing to orthopantomography (OPG). Material and Methods: Fifty-one dental patients, aged between 20 and 77 years, were quantitatively analyzed and 81 dental patients, aged between 20 and 79 years, were qualitatively analyzed. ANOVA and Mann-Whitney tests were used for statistical analyses. Results: Strong statistical significant differences were recorded between CBCT and OPG assessments for all groups of teeth (p<0.001), when evaluation was performed on distances to mandibular base. When assessing the distance to the incisive canal, the differences were recorded only for the left canine zone. Mean densities of central incisor, lateral incisor and canine regions, were 1,400-1,425 HU, 1,212-1,224 HU, and 1,150-1,175 HU, respectively. There was a marginal statistical evidence that bone density was lower in canine zone comparing to central incisor area (p=0.08). Conclusions: Measurements on CBCT are more accurate when compared with OPG. Bone density of central incisor region is higher. Therefore, CBCT permits the clinician to have all necessary information when planning dental implants. The male gonad receives nerve fibers from the autonomic ganglionic system. By the present study, we aimed to bring detailed evidences, topographic and structural, on the spermatic ganglia (SG) in humans, as suppliers of autonomic fibers for the testis. We performed retroperitoneal dissections in 25 formalin-fixed human male adult cadavers. Histology used the Hematoxylin-Eosin and we also used Bielschowsky silver stains. Immunohistochemistry used antibodies for tyrosine hydroxylase. In 20/10 specimens, we identified left spermatic ganglia (LSG) at the aortic origin of the left testicular artery (LTA); in five specimens the LTA left the renal artery but LSG were juxtaposed on the aorta at about the level of origin of a normal LTA. In 15/25 cadavers, there were right spermatic ganglia (RSG) related to the right testicular artery (RTA) that in 12 cadavers had a precaval disposition. A specimen with retrocaval RTA presented an inferior renal ganglion, supplying both the renal and the RTA. The SG presented renal, lumbar and intermesenteric roots. The inferior branch of the SG connected it to the inferior mesenteric plexus while its infero-lateral branch adjoined the testicular artery. Microscopy confirmed the SG as nervous ganglia and the respective neuronal populations were tyrosine hydroxylase positive, allowing us to consider these ganglia as sympathetic. We bring here the first-time evidence of the SG topography and cathecolaminergic nature in humans; this ganglion may influence the male gonad via the inferior mesenteric plexus and via the vascular path of the testicular artery. Stroke is the third leading cause of death and the first cause of disability with an increasing incidence, especially of the ischemic type. There is no effective curative treatment for stroke and therefore the therapy for this disease currently relies on identifying patients at risk and instituting preventive measures. Since ischemic stroke in middle cerebral artery territory (and with preferential localization in the striated nuclei) is the main type of stroke in humans, animal models obtained by surgical ligation of the middle cerebral artery (MCAO) are valuable tools for the fundamental study of this disease. In this study, we investigated the morphological and immunohistochemical remodeling of the tissue after stroke and in particular the vascular component in a MCAO murine model. The analysis included the sequential sacrificing of animals at 1, 14, 28 and 60 days post-stroke and brain processing for paraffin embedding and sectioning. Our results show a gradual revascularization of the lesion as we move away from the time of the surgical intervention. This effect is accompanied by the development of an increasingly dense glial scar at the periphery of the lesion. The perilesional area itself, the penumbra, is characterized by minimal histological changes (such as eosinophilic neurons), but also by an increased expression of activated caspase 3 as a sign of apoptotic neurons and glial cells. Our study confirms the potential of the organism in its attempt to revascularize the injured area, and raises questions on the role of the glial scar in limiting the process of neovascularization. Background and Purpose: For the past few years, in an attempt to find new sources of cells that may be used in cell therapy, numerous researchers have highlighted the particular properties of mesenchymal stem cells. Mesenchymal stem cells can be isolated from adult tissues such as the bone marrow or adipose tissue, but also from other organs such as the human placenta. Our study focuses adult stem cells isolated from the chorionic villi in an attempt to differentiate them into islets of Langerhans in order to study their differentiation potential, as a future background for cell therapy. Experimental Design: Full-term placentas were prelevated from volunteer women that have just delivered a normal pregnancy. After a mechanical fragmentation of the placenta, the chorion fragments are transferred in a dish with dispase before the enzyme is inactivated using fetal calf serum. The cell suspension is filtered in order to obtain a single-cell suspension. After the adherence of the first cells, the proliferation rate increased progressively and cell morphology is kept the same for several passages. In order to correctly differentiate placental stem cells into glucagon-secreting cells, we used a culture method on a scaffold with sequential exposure to different growth factors. The underlying substrate used contained type IV collagen, chytosan, Matrigel and laminin. Molecular biology techniques were carried out to investigate the gene expression of the stem cells. Results: Our results show that exendin-4 is able to induce the differentiation of placental stem cells into glucagon-secreting cells. We also notice the absence of the insulin gene, a conclusion that may be explained by the fact that our phenotype is a partial one, incomplete, closer to islet cell progenitors than to insulin-producing progenitors. Conclusions: The identification of the placenta as a valid source for stem cells has important practical advantages because it is easily accessible, it raises no ethical issues and cells are easily to isolate in a large enough number to use. The future knowledge and manipulation of the signaling pathways that determines the dramatic phenotype shift may provide the basis for efficient cell differentiation, with great impact on regenerative medicine and tissue engineering. Wistar rats have been exposed to progressively higher temperatures for 30 minutes to 40.5 degrees Celsius. The animals were sacrificed 30 minutes after cessation of exposure. Harvested organs (heart, lung, liver, pancreas, kidneys, and adrenal gland) show numerous vascular lesions. Massive red blood cells extravasation and vascular stasis partially fragments the myocardial fibers. Pulmonary capillary dilatation and red blood cells intra-alveolar extravasation cause a hemorrhagic alveolitis that tends to a red hepatization. The liver responds by dilating centrolobular veins, vessels in port area and by granulo-vacuolar dystrophy. Pancreas seems less affected. Vascular hyperemia is discrete while in kidney the vascular spaces are narrowed and the proximal and distal tubules cloudy intumescent appears. In suprarenal gland appear many interstitial capillary dilatation and blood cells extravasation among cell nests of medulla. All these changes induce functional organ failure. The paper represents a parallel study regarding the harmony between the ultrasounds and the frozen section diagnosis in the breast cancer. 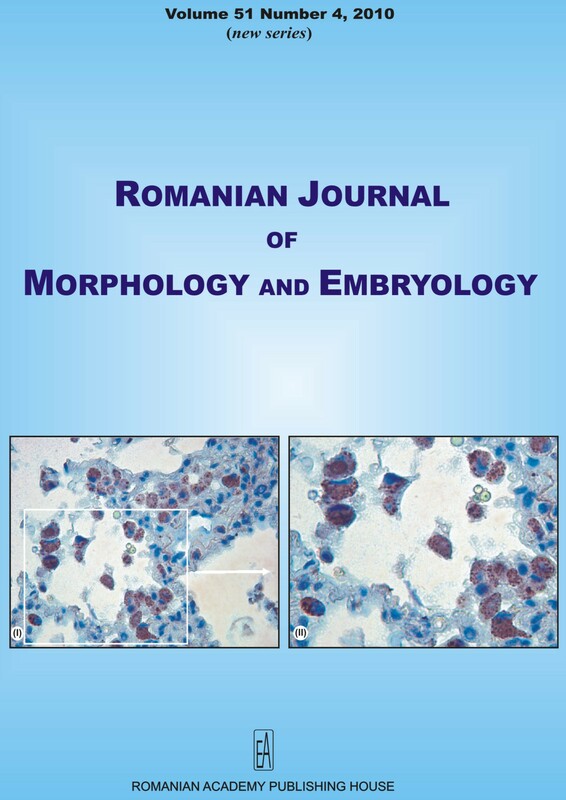 Patients and Methods: We examined at an ultrasounds machine a group of 146 women aged between 16-73-year-old, which came presenting palpable formations at the level of breasts, in the Pelican Medical Centre from Oradea. The suspect lesions were subject to excisional biopsy or surgical intervention. Results: The elements followed at the ultrasounds exam were: echogenicity, echostructure, contour, presence and absence of posterior shadowing, microcalcifiation, orientation of lesion, compressibility, aspect of adjacent structures. Histopathological diagnosis of suspect lesions emphasized malignant lesions in a percentage of 64.86% of cases; the frozen section exam diagnosed invasive ductal carcinoma in 86% of the cases, invasive lobular carcinoma 8%, medullar carcinoma 2%, and benign lesions 4%. Conclusions: The clinical-anatomopathological collaboration is absolutely compulsory for a correct microscopic diagnosis. The ultrasounds modifications separated after the criteria taken into account allow the orientation of diagnosis to malignant-benign. At 14% of the women examined, additional lesions were identified in comparison to those palpated, the ultrasounds having a role in detecting the multifocality and muticentricity of lesions. At 29.05% from the identified lesions, malignant lesions were histopathologically identified. The frozen section diagnosis in the breast cancer allows a rapid diagnosis, correct in high percentage of cases, allowing taking an intra-surgery therapeutic attitude in only one surgical intervention, thus reducing the costs. The anatomopathologist's experience reduces the diagnosis risk in excess and/or in minus. Purpose: Age as poor prognostic factor following nerve repair may be due to change in intraneural anatomy with age. The purpose of this study is to find out the cross sectional microanatomy of the superficial branch of radial nerve (SBRN) at distal part of forearm for changes in the fascicular, non-fascicular components with respect to age and also to find cross section area of SBRN in healthy volunteers. Material and Methods: Sixty fresh human (37-88-year-old) cadaveric SBRN were collected from the distal part of forearm and studied at different magnifications after histological processing for morphometric analysis - total cross-sectional (Asc), fascicular (Af) and non-fascicular area (Anonf). Fifteen volunteers SBRN cross sectional area was measured by ultrasonography (US). Results: The SBRN was found to have 6-12 fascicles. Morphometric and correlation analysis confirmed that there was a significant increase of total cross section area, with significant increase of interfascicular adipose tissue in relation to advancing age. Ultrasonographic cross-sectional area ranged from 2 to 3.3 square mm. Conclusions: Our study revealed comparatively more adipose tissue in human SBRN with advancing age. These findings may help to explain poor prognosis with advancing age following repair. SBRN ultrasonographical Asc was comparable to histological Asc. Further, it is possible to find Asc of SBRN by non-invasive US study and calculate the fascicular and non-fascicular area using our histological findings. Milky spots are opaque patches in the greater omentum. They were first described by von Recklinghausen (1863) in the omentum of rabbits. In man, milky spots are relatively uniform, highly vascularized accumulations of mononuclear cells. The objective of this study was to describe in human omental lymphoid tissue components with S-100. Tissue samples (greater omentum) were collected from 14 patients operated with different reasons in our Department of General Surgery, in order to histologically present the presence of S-100 in the cells making up the milky spots in human omentum tissue. Tissue samples were cut approximately 5-8 micrometer thick with frozen-sections and stained with an indirect immunoperoxidase technique, as described previously. Then milky spots were examined by light microscopy. These data indicate that unstimulated milky spots in the human greater omentum are to a great extent just a preformed specific accumulation of primarily macrophages within the stroma of the greater omentum, secondarily B- and T-lymphocytes. In addition to these cells, we observed that a few mast and reticular cells were seen in the milky spots by S-100 reactive cross-sections of greater omentum. In the human omentum tissue that was stained with indirect immunoperoxidase method using anti S-100 monoclonal antibody, an arteriole cross-section in the center, reactive nerve cross-sections in the adjacent stroma and endogenic peroxidase reactivity in a few granulocytes in omental tissue were observed. This paper presents the results of a surgical and histopathological study regarding the microanatomical modifications of the thoraco-abdominal diaphragm and of the peri-esophageal structures in the hiatal hernias, establishing a cause-effect relationship between these structural modifications and the hiatal hernia. The study was represented by two groups of patients: a control group and a group with hiatal hernia. The study method consisted in intraoperatory biopsy of fragments from the diaphragm as well as from the tissue around the esophagus, which were studied from the histopathological viewpoint, using histological methods and quantitative microanatomy. In the end, the results obtained from the two groups were compared. The microscopic examination revealed the presence of an inflammatory infiltrate located between muscle fibers, especially near blood vessels, at the level of the diaphragm crura and the phreno-esophageal membrane. Also, they found red blood cell at this level, most likely due to pressure from the hernia at this level. From the quantitative micro-anatomical viewpoint, there has been noticed an increase in the percent of the vascular lumen (accentuated vasodilatation) as well as the interstices occupied with the edema and hemorrhage, to the detriment of the muscle fibers, the most significant modifications being met at the level of the crura. Angiokeratomas are vascular malformations that usually appear as multiple or solitary cutaneous plaques. Several clinical variants have been described, with the same underlying histopathological lesion. Mucosal involvement, including the oral cavity, is occasionally found either as a component of the systemic variety, called angiokeratoma corporis diffusum, or associated with cutaneous lesions in more locations. Isolated oral involvement seems to be rather infrequent and only five cases have been described in adults in the world literature. We herein report another case of this rare entity affecting a 62-year-old woman in the dorsum at the tip of the tongue. This is the first report including an immunohistochemical study to discard a lymphatic origin of the tumor. Aim: To present two cases of papillary carcinoma of the thyroglossal duct cyst (TDC) and to report their management. Patients and Methods: Two patients, a 47-year-old woman and a 60-year-old man, were operated in 2006 and 2008 in the Department of Digestive and Metabolic Surgery of the "Jean Verdier" Hospital. Results: The diagnosis of papillary carcinoma was established after the pathological examination carried out on the thyroglossal duct cyst, after its complete surgical excision. A total thyroidectomy followed by a treatment by radioactive iodine and a substitutive hormonal therapy were carried out in the second time for one of the two patients. For the other patient, a total thyroidectomy followed by a substitute hormonal therapy, were achieved. The evolution was favorable, with a follow-up of four years for the first patient and two years for the second one. Discussion: Total thyroidectomy after the complete excision of the cyst is currently the recommended treatment for the papillary carcinoma of the TDC. It was shown that a latent thyroid cancer could develop even 15 years after the initial excision of the thyroglossal cyst. The treatment is curative in 95% of the cases. Conclusions: Current treatment of papillary carcinoma of the thyroglossal duct cyst is well codified, allowing an excellent prognostic. The patient's desire to preserve their natural dentition is increasing constantly; therefore, nowadays dentists have to treat teeth that once would have been extracted. Using endodontics, periodontics and restorative dentistry techniques, we can maintain these teeth on the arches in whole or in part and they can be used as independent units of mastication or as abutments in simple fixed bridges. This article describes a procedure of modifying the form and shape of the prosthetic restoration of a maxillar molar after a crown and root amputation. Bilateral dissections of maxilla were performed in a human adult cadaver head, male, aged 53 years. After the en block removal of the soft tissues in the oral and infraorbital regions, the antero-lateral surface of maxilla was exposed and also the vestibular aspect of the upper alveolar process. An oblique labially impacted right upper canine was evidenced, completely submucosal: its apex was tangent to the maxillary sinus floor, while the superior side of the apical part of the root was in close relation with the floor of the laterally expanded inferior nasal meatus. Superior and adjacent to the neck of that impacted canine a follicular cyst was evidenced and the antral wall presented distally to the apex of the impacted canine a dehiscent area, where the antral mucosa was only covered by an incomplete thin bony lamella. The incisors on that side were present but no resorption was identified at their level. Within the anterior border of the wall separating the maxillary sinus, small, and the inferior nasal meatus, the nerve for that impacted canine was coursing; the nerves for the upper incisors were initially located within the antero-lateral wall of the inferior nasal meatus. Although small, the maxillary sinus presented a supero-medial recess above the enlarged inferior nasal meatus and lateral to the normally-sized middle nasal meatus. We present a case of 48-year-old male with a nine months history of right inferior thoracic (T10-T12) paravertebral mass, which became painful after a back trauma; dyspnea and hemoptysis were associated. The preoperative native and with contrast substance CT revealed a tumor mass extended from the right paravertebral muscles to the diaphragmatic right pillar muscle, invading the postero-basal pleura and the posterior arches of the right XIth and 12th ribs with osteolysis. Fragments of 10 cm large tumor resection specimen (striated muscle, dense connective tissue, adipose tissue, lymph nodes and intercostals nerves) were routinely processed, further immunohistochemical investigations were needed, using Dako antibodies pan-CK clone MNF116, CD34, CD20, vimentin, synaptophysin, melanoma HMB45 clone, with LSAB 2Kits system and further CK AE1/AE3, CK7, CK20, CEA, S-100 protein, CD31, von Willebrand factor, D2-40/podoplanin, Ki-67 antigen, with EnVision system and DAB visualization in both systems. The histological and immunohistochemical aspects were indicative for soft tissue epithelioid angiosarcoma, which was misdiagnosed on frozen and HE sections as a carcinoma, because of the cohesiveness and nesting properties of the malignant cells, together with the presence of lymph node metastases. The proliferative activity of the malignant cells, highlighted by Ki-67 antibody, clone MIB 1 was high (30% of malignant cells were positive at HPF). The patient was discharged with adjuvant therapy indication: radiotherapy and chemotherapy. The tumor locally recurred 12 months afterwards, but the patient is still alive 22 months after surgery. If the clinical goal of the periodontal plastic surgery is the complete root coverage of gingival recessions, then the microscopically goal standard is to obtain a true periodontal regeneration. Only the histological examination can reveal cellular events unrolled into the grafted tissue-root surface interface and the nature of the clinically observed attachment. To our knowledge, there are no studies that obtained the biopsies of grafted tissues from humans, in vivo, and so, the aim of the present study was to develop such a method, using a bone marrow biopsy needle. Two patients with gingival recessions were treated with coronally advanced flap and subepithelial connective tissue graft, and the clinical and histological results were observed. Complete root coverage was obtained for both cases. Clinically, the grafted tissues seemed to be attached to the root surfaces. The histological findings revealed dense grafted tissues, providing long-term stability of the area. No ligament or bone, characteristic for periodontal regeneration were observed. However, no sign of healing characterized by a long junctional epithelium was observed either. This indicated that the healing that occurred in our cases was a long connective tissue attachment, which has been shown to be stable over time. However, even if the method we proposed is not invasive, it is very difficult to convince the patient to accept a biopsy elevation once the exposed root surface was covered. A cadaveric study was undertaken to report the incidence of sternalis muscle in cadavers of Asian origin. A total of 88 cadavers were studied over a period of six years and the sternalis was reported only in a single case and that too unilaterally. The accessory muscle was discovered in the right pectoral region in a 40-year-old male cadaver. The muscle emanated from the external oblique aponeurosis of abdomen confirming its origin from the ventral longitudinal sheet of muscle. The muscle was fleshy throughout its extent except at the ends where they were aponeurotic. At the sternal angle, the muscle displayed "Y" shaped configuration and merged with the respective sternocleidomastoid muscle. The innervation was derived from the third intercostals nerve. We intend to highlight a few points through this study. Firstly, we found a paucity of studies undertaken to describe the incidence of sternalis muscle. Further, the studies present in anatomical archives are mainly case reports. Secondly, this muscle presents itself in varying configurations on radiological studies. The radiologist should acquaint himself with all these presentations, so that he can make accurate diagnosis of a breast mass. Thirdly, this muscle having more morphological relevance may be conveniently utilized for flap procedures of post mastectomy breast reconstruction. Lastly, the presence of this muscle may alter the depth at which the internal mammary lymph nodes are irradiated in case of carcinoma breast. Additionally, it should not be erroneously diagnosed as a mass which recurred on follow up of breast cancer patients. The present investigation endeavors to discuss the anatomical, embryological and clinical relevance of a rare accessory muscle of the anterior chest wall.